The MB 90 is a tandem two-seater, featuring a high wing of metallic construction and a steel-tube fuselage, both canvas-covered. It made its maiden flight in June 1932. Marcel Bloch developed the MB 90 in order to enter Challenge 1932, the third FAI International Tourist Plane Contest. It was Marcel Bloch’s first tourist plane and could have carried private pilots over the Alps. Marcel Bloch developed the MB 90 in order to enter Challenge 1932, the third FAI International Tourist Plane Contest. It was a tandem two-seater, featuring a high wing of metallic construction and a steel-tube fuselage, both canvas-covered. 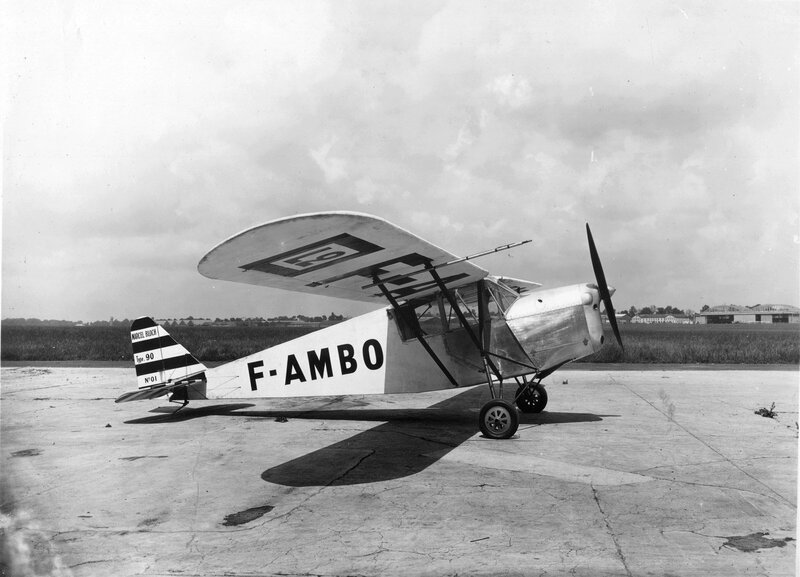 Two aircraft were built, the first of which, registered F-AMBO, made its maiden flight in June 1932. Both aircraft were entered for the International Challenge. One was to have been flown by Desmazières, who had completed a Paris-Madagascar flight with René Lefèvre in 1931. They were equipped with 105hp De Havilland Gipsy III engines driving two-blade wooden propellers. Even though the aircraft did not in the end participate in the Challenge, it attracted considerable interest, since the announced speed and ceiling – 220km/h and 6,000m, respectively – could have carried a private pilot over the Alps. The MB 91, fitted with a 120hp Pobjoy Niagara engine, was presented in 1933. The triangular tail fin was replaced by a rounded design. The machine did not fly and was displayed at the 1932 Show with a Renault engine. The MB 92 “Grand Tourisme” flew on 9 September 1932, with Zacharie Heu at the controls. Features included a rounded tail fin; 120hp Renault 4 Pei engine (the same as on the famous Stampe), driving a metal propeller; non-parallel struts; and single-piece landing gear braces. The aircraft, registered F-AMQT, was purchased by an individual called Clément. In July 1933, the MB 90-01 (F-AMBO) belonging to Desmazières returned to flight as the MB 93. It featured a rounded tail fin, divergent struts, triangular rear windows and a 120hp De Havilland Gipsy Major I engine. It enjoyed no more success than its predecessors.